Open 5pm-midnight (LO; Fri, Sat -3am) daily. Nikuzushi is a real treat for meat lovers - you can enjoy tasty, bite-size morsels of various cuts of beef, pork, duck, chicken, venison, horse and other meats, served as nigiri-zushi over dabs of vinegared rice. Assortment platters are a good way to compare different cuts of meat and preparation styles - an entertaining alternative to simply plowing through a big steak. 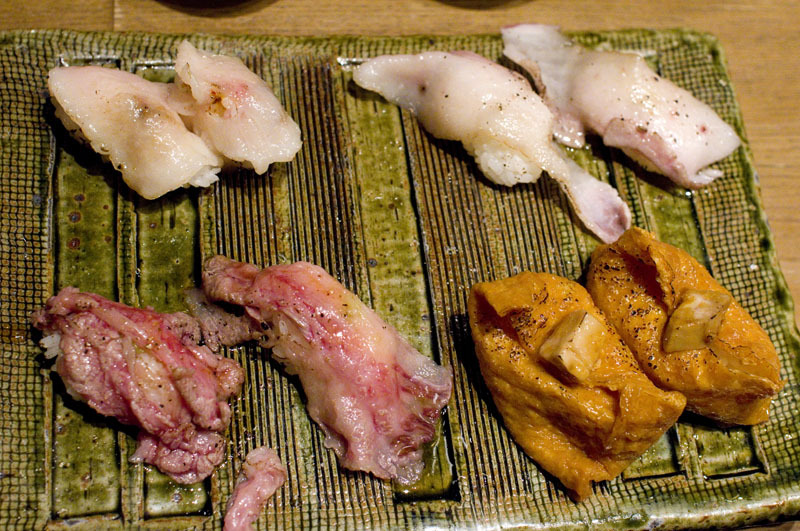 Most meaty toppings are cooked, or at least lightly seared, but they also serve sashimi-style raw chicken and horsemeat. The selection of sushi by the piece features tempting items like roast beef, beef tongue, beef with sea urchin, duck breast, foie gras, avocado-chicken salad and sukiyaki. Various assorted platters are also nicely put together, but try to order at least one platter for each person at the table so you don't have to fight over who gets which piece. 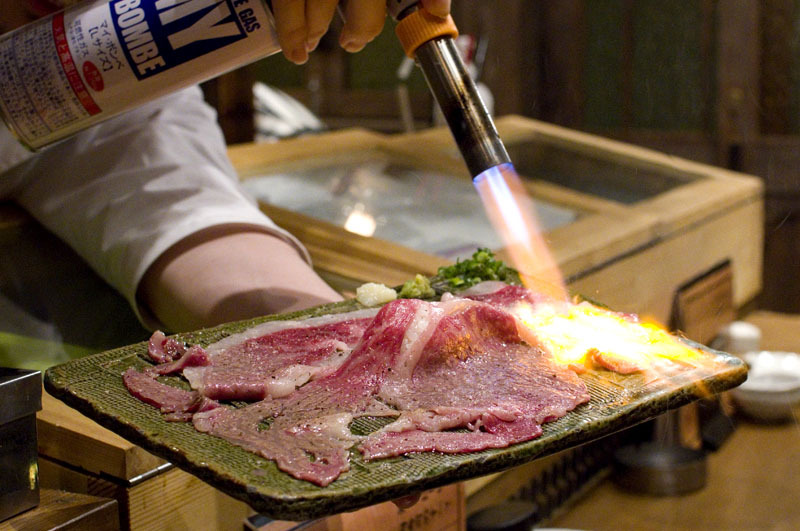 One of the must-try dishes here, recommended by our chef, is the torisashi platter - very thinly sliced, fatty cuts of beef short ribs, seared with a blowtorch and seasoned simply with salt and pepper. It's a perfect balance of fat, salt, meat and lightly charred bits, served with just a tiny mound of sushi rice in the middle of the plate so that it technically qualifies as a piece of sushi. The raw chicken is an heirloom-breed bird from Miyazaki Prefecture - tender breast meat served with a hefty dose of wasabi. 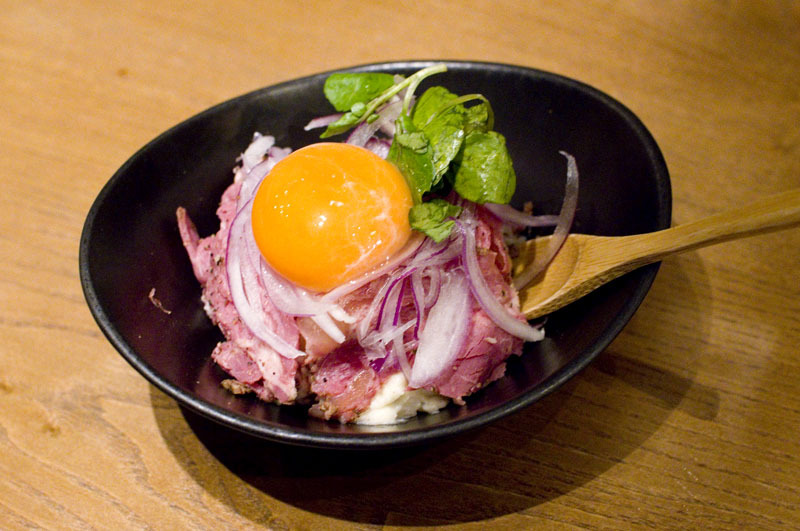 Nikuzushi's special potato salad, incorporating onions, greens and a raw egg, provides a nice break from all the meat. 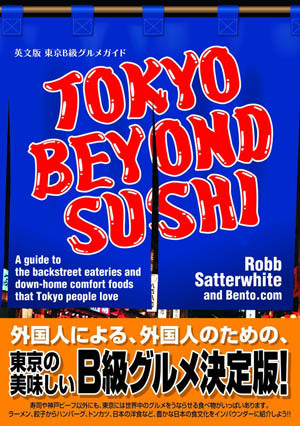 There's a small but serviceable list of around a dozen sake and around the same number of shochu, some of which are said to go especially well with horsemeat. 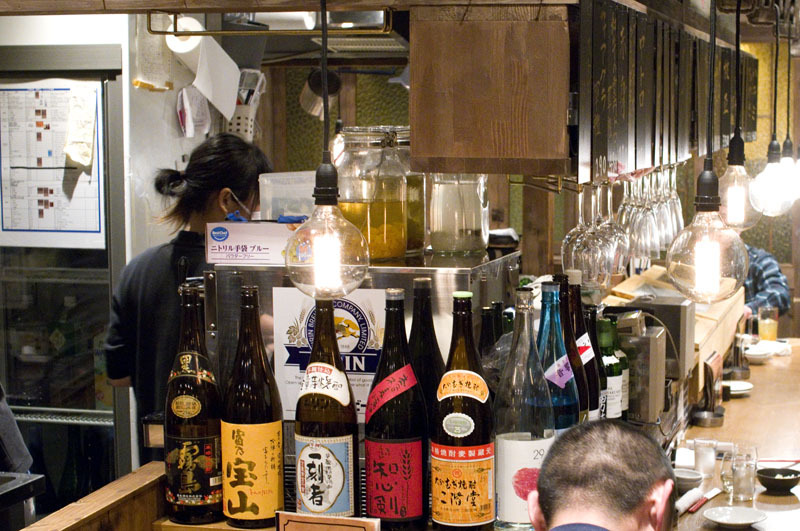 The dining room looks like a typical after-work izakaya in style, with most seating at the counter, plus a handful of small tables with stools in back. Budget around Y3000-4000 for ample food and drink at dinnertime. 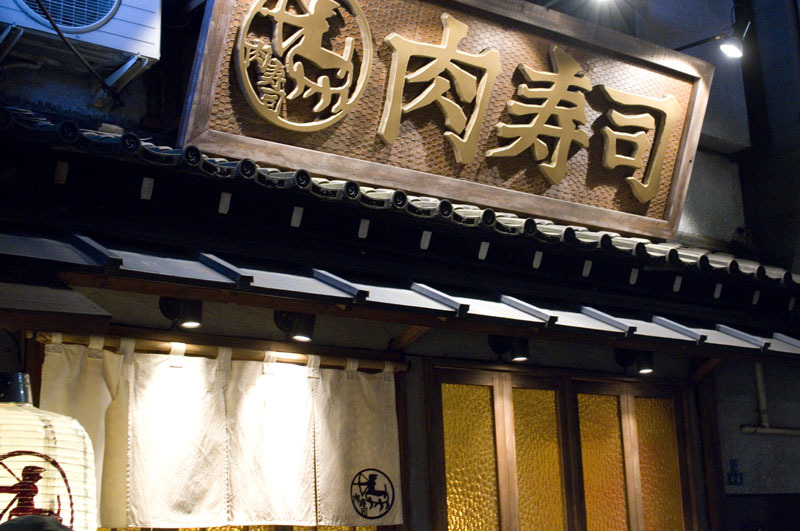 In case the Monzennakacho location is inconvenient, Nikuzushi has several other locations around town.